With the exception of climate change and fossil fuel, few environmental topics are as controversial as food security, particularly when framed in the relationship between production and population. Over a billion people on the planet today go hungry—more than at any other time in human history. And experts maintain that we must double food production by 2030 to avoid an agricultural Armageddon. But hackles rise at the moral pessimism implicit in the warnings of 18th century demographer Robert Malthus that subsistence increases in an arithmetic ratio, while population, if unchecked, grows in a geometrical progression. And technophiles bristle at the suggestion that science, via breakthroughs like the “green revolution” of the 1960s—which doubled grain yields globally through a combination of improved seeds, fertilizers and chemicals—will not be equal to this challenge. Meanwhile, a groundswell of public opinion bewails the obvious environmental costs of this revolution in terms of dangerous pesticides, soil erosion, groundwater depletion, poisoned waters, and dead wildlife. At the same time, changing diets of the burgeoning middle classes and increasing reliance on corn-based biofuels means that demand for animal protein and grains is skyrocketing worldwide. Another rising tide of popular sentiment rejects all genetically modified foods, even though agricultural domestication is rooted in tweaked genes. Concomitantly, more people each year are seeking organic foods which are becoming widely available in mainstream grocery stores as well as in niche and farmers’ markets. Mired in these conflicting currents, the green revolution has screeched to a halt as we have fouled our own nests in pursuit of plenty. What can be done to escape this impasse, perhaps through a truly sustainable greener revolution? 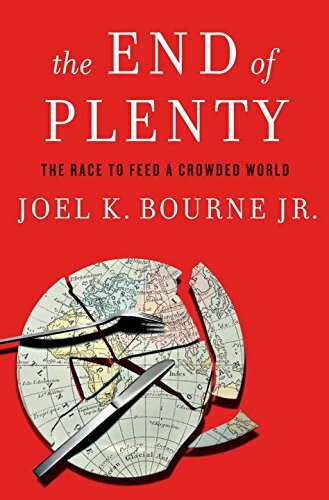 In The End of Plenty: The Race to Feed a Crowded World environmental journalist Joel K. Bourne Jr. demonstrates that he is in a prime position to explore promising strategies for leading us out of this unprecedented crisis. Growing up on his family’s farm, Bourne internalized the spirit of sustainable living in ecosystemic balance; however, this ethos was challenged head on by the mid-20th century change from American farming as a family affair to agribusiness through the intensification and mechanize of production. Nonetheless, this background in agronomy, combined with hands-on experience and practiced ease in conversing with farmers stood Bourne in good stead over his years of working with rural topics as a contributing writer for National Geographic (“I was the only one on staff who spoke fluent ‘redneck’“) and in travelling the world researching projects for increasing agricultural productivity via a lighter ecological footprint. In the first part of the book, Bourne examines the legacy of Malthusian demographics, which emphasize food supply versus population growth and the implications of this for mass die-off without preventative checks. Against this backdrop, he provides a synopsis of the mid-20th century green revolution and the spectacular achievements of its “miracle grains,” along with unintended consequences including profligate use of water and the environmental and health effects of high levels of agrichemicals. The green revolution came with heavy social costs as well since the bulk of the benefits flowed to larger landowners, while increased mechanization and monocultures reduced the need for labor triggering a flood of peasant migration to cities. Bourne tells heart-rending stories of this unforeseen human toll, such as the wave of suicides that shook rural India where, on average, a small farmer committed suicide every 32 minutes during the past decade and a half. In the second part of the book Bourne strikes a more optimistic note, pointing to new initiatives that might mitigate past mistakes or tap undeveloped or under-utilized resources. For example, he identifies substantial aquifers in India and Africa that could be used sustainably and explores opportunities for increasing water-use efficiency and equity of access through improving microirrigation for small-plot farmers. We meet corporate cowboys attempting to revive Ukraine as Europe’s breadbasket in a post-Soviet land rush, a Canadian aquaculturalist channeling ancient Chinese traditions as part of a booming blue revolution, the visionary behind the world’s largest organic sugarcane plantation and many others who advocate a return to traditional production methods that conserve resources. These ventures are challenged constantly by increasing uncertainties associated with anthropogenic climate change and by the ever-extending tentacles of galloping globalization. Most enlightening is the fresh eye that Bourne casts on the oft-maligned GMO (genetically modified organism) breeding technologies, which have the potential to improve nutrition for billions of the world’s hungry despite widespread fears about possible health hazards. These foods include “scuba rice” which can tolerate extended flooding and “golden rice” that produces the vital micronutrient vitamin A. He also discusses the development of nitrogen-fixing grasses to replace harmful chemical fertilizers and explores opportunities for concentrated meat production and aquaculture. Although these projects look encouraging, they can only make a serious dent in world hunger as part of a long-term, integrated and holistic approach to increasing food supplies on a planet of sustainably sensitive producers and consumers. In order to achieve this goal, Bourne insists that we must prioritize the eradication of the root cause of the population explosion—the lack of empowerment of women. Investments in education for girls, access to family planning information, and increased equity in resource access are more fundamental for feeding future populations than relying on technological innovation to increase production. In sum, Bourne has written a comprehensive, compelling and thought-provoking narrative about an unparalleled world food crisis at the intersection of population, production, hunger, health and social justice. The book is written in accessible, yet technically precise language, enlivened by anecdotes and well-told personal stories from numerous informants. The extensive endnotes, bibliography and detailed index speak to thorough and thoughtful scholarship and responsible journalism. On the negative side, some of the chapters seem rather disjointed, perhaps because they were cobbled together from Bourne’s 2009 National Geographic cover story with the same title? Plus, the segments on climate change and water resource management seem somewhat cursory given their critical importance to farming in today’s warming world. Nonetheless, The End of Plenty offers an invaluable projection of alternative scenarios for the future of food and, indeed, of humankind and is a wake-up call for us all.